Early foreign diplomatic entertainment by the Foreign Secretary took place in local taverns or at his home, but by the 1850s the London Diplomatic Corps had increased so greatly that there were very few places sufficiently large enough to contain it. 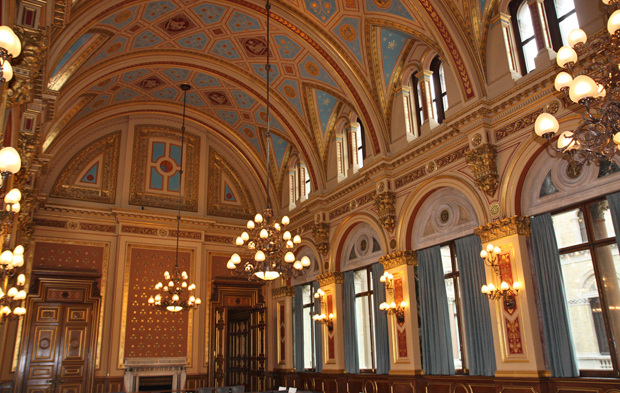 Therefore, in 1858 the Parliamentary Committee on Foreign Office Reconstruction was told by Edmund Hammond, the Permanent Under Secretary, that in any new building it was ‘essential that the Secretary of State for Foreign Affairs should have the means of giving large dinners …and that he should have reception rooms capable of holding 1,200 or 1,500 people’. Following these representations, the architect of the new Foreign Office, George Gilbert Scott, designed a magnificent suite of three rooms on the first floor. 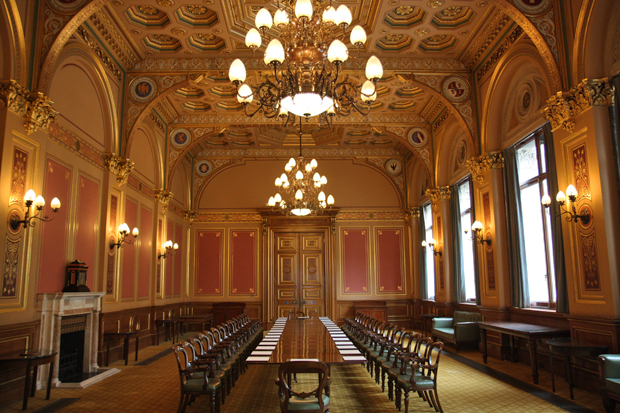 This consisted of the lofty ‘Cabinet Room’ (now known as the Grand Reception Room) with its barrel vaulted roof, the smaller square Dining Room and the Conference Room (pictured below) with its gilded ceiling supported by brackets embellished with emblems of foreign countries. Scott’s intention was to create a feeling of grandeur evoked by spaciousness: in effect ‘a kind of national palace, or drawing-room for the nation’. Until 1914 the suite was in constant use for entertainment and conferences. It was invariably the venue for the royal Birthday celebrations. During the First World War, however, an acute shortage of space within the Foreign Office led to the entire Reception Suite being used as offices. This was not a success. The original Victorian decorations became very shabby and the rooms were considered too dark and draughty for daily use. When Austen Chamberlain became Foreign Secretary in 1924 he was anxious that they should revert to their original purpose. The Office of Works asked if the rooms should be redecorated, but before a decision could not be made on style, Chamberlain diverted his attention to the Locarno Treaties. When the Treaties were initialled in Locarno in Switzerland in October 1925, the delegates agreed to come to London for the formal signing of the Treaty the following December. The only possible venue for the ceremony was Scott’s Reception suite. The Locarno Treaties were duly signed in the Reception Suite on 1 December 1925. Later in that month the newly created Royal Fine Art Commission recommended that the rooms be redecorated. At the completion of the works, the three rooms were renamed the ‘Locarno Suite’, as a memorial to a supposed diplomatic triumph promising an era of international cooperation. In 1935 the Locarno Suite was chosen for the opening session of the International Naval Conference, and in March 1939 a splendid dinner party took place there in the presence of King George VI and Queen Elizabeth during the State Visit of President Lebrun of France. On the outbreak of war later that year, the chandeliers were shrouded and the Locarno Suite became the home of the Cyphering branch of the Communications Department. An even more acute shortage of office space after 1945 led to the division of these rooms into cubicles under false ceilings, and in these makeshift plasterboard hutches, the Legal Advisors and others worked. This is how the Locarno rooms remained until the FCO’s rolling restoration and refurbishment programme reached the Suite in the late 1980s. In the Dining Room the removal of the plasterboard uncovered the original stencilled decoration, and although faded, it allowed for an exact copy to be superimposed. Two new doors, matching exactly Scott’s design, were also installed. The restoration of the Grand Reception Room involved much painstaking detective work. It was feared that during the 1920s decorators may have removed elaborately detailed designs from the ceiling. However close examination revealed the section had simply been painted over, and with the help of scientific analysis, the ceilings were successfully restored according to the original design. 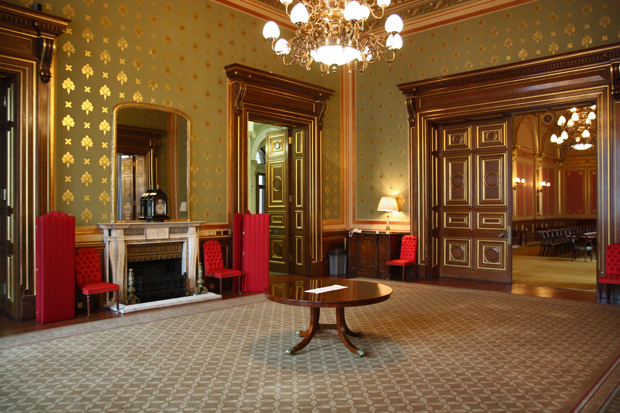 The Locarno Conference Room reverted to its original purpose in summer 1990, while the restoration of the Reception and Dining Rooms proceeded between 1990 and June 1992. Following the restorations, the entire Locarno Suite is once more available for conferences and ministerial and government functions. More recently, Her Majesty Queen Elizabeth II visited the Suite during her tour of to the FCO in December 2012 as part of her Diamond Jubilee celebrations. I had never seen any pictures of the Locarno Room, and I did not know they were open to the public. Very interesting. You forgot to mention that the Non Intervention Committee held its sessions here during the Spanish Civil War. The ambassadors of 22 countries, including Germany, Italy, the USSR, France, Holland, or Belgium, met among these walls, never reaching true agreements on Spain and probably knowing that their nations would clash shortly during the worst war known to humanity so far. I would love to see these rooms in person. Any chance they will be open in July 2014? We've just taken part in London Open House 2013, where members of the public were able to tour the Foreign Office building. Sadly, there are no plans to open the building in July 2014, but we will be taking part in London Open House in September 2014. Hope you can make it then! I would like to illustrate a book that I am writing on architectural colour with an image of the Dining Room of the Locarno Suite. Would there be any chance of obtaining a JPEG and the necessary permssions? I worked on the paint analysis in various parts of the FCO in the early 1990s. I'm sure we can arrange something to be sent, I'll contact you through your email address in due course.